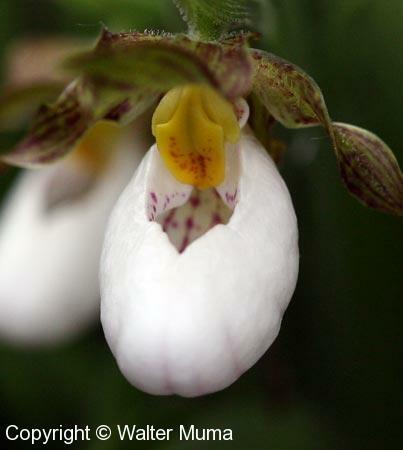 Distinctive features: Small plant, closely resembles Small Yellow Lady's Slipper except for flower colour. 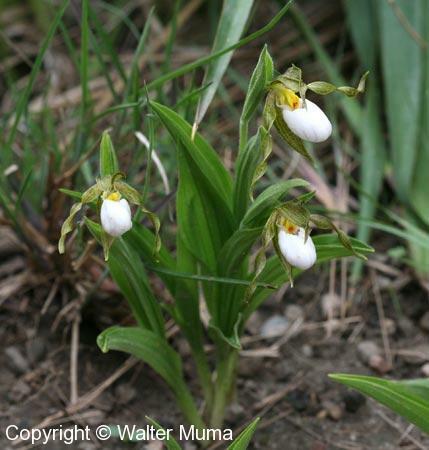  Small Yellow Lady's Slipper (Cypripedium parviflorum var makasin) - Flowers are bright yellow; petals (behind the "slipper") are purplish. 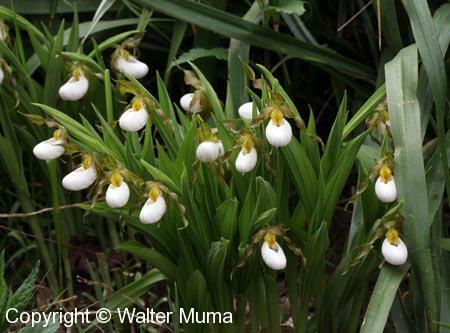  Hybrid Lady's Slipper (Cypripedium parviflorum X C. candidum) - Flowers white; purplish petals. 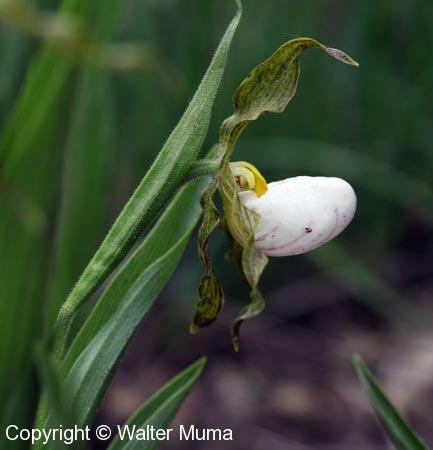  Large Yellow Lady's Slipper (Cypripedium parviflorum var pubescens) - Flowers yellow; larger; greenish petals. Photographs: 57 photographs available, of which 7 are featured on this page. SCROLL DOWN FOR PHOTOGRAPHS. 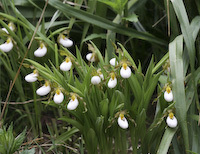 Small White Lady's Slipper are actually quite small. 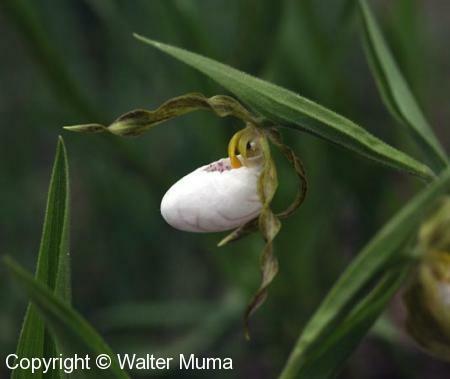 Small White Lady's Slipper has the typical "pouch" of Lady's Slippers. 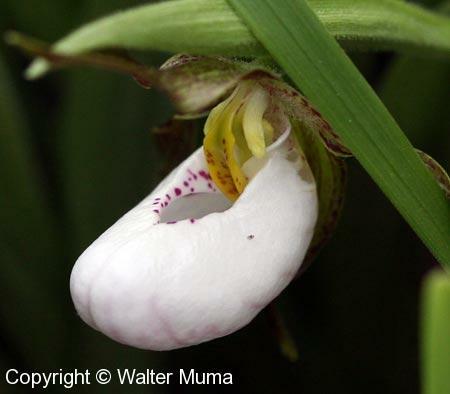 The petals (behind the "slipper") are greenish. Closeup view of the flower. 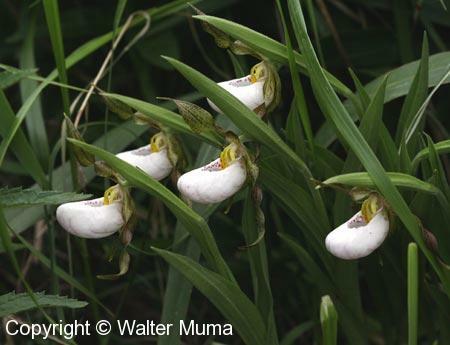 A nice patch of Small White Lady's Slippers.